Hague Convention: The Hague Convention on the Protection of Children and Co-operation in Respect of Inter-Country Adoption (Hague Adoption Convention) is an international agreement to establish safeguards to ensure that intercountry adoptions take place in the best interests of the child. The Hague Adoption Convention applies to adoptions between the United States and the other countries that have joined it. Home- study: An assessment of prospective adoptive parents to see if they are suitable for adopting a child. It can last between 3-7 months from start to finish mostly depending on how fast you work to get the info the require. Placement: A term used to describe the point in time when the child comes to live with the adoptive parents in their home. Certification or Authentication: Verification of the genuineness of a document or signature to make it effective or valid. 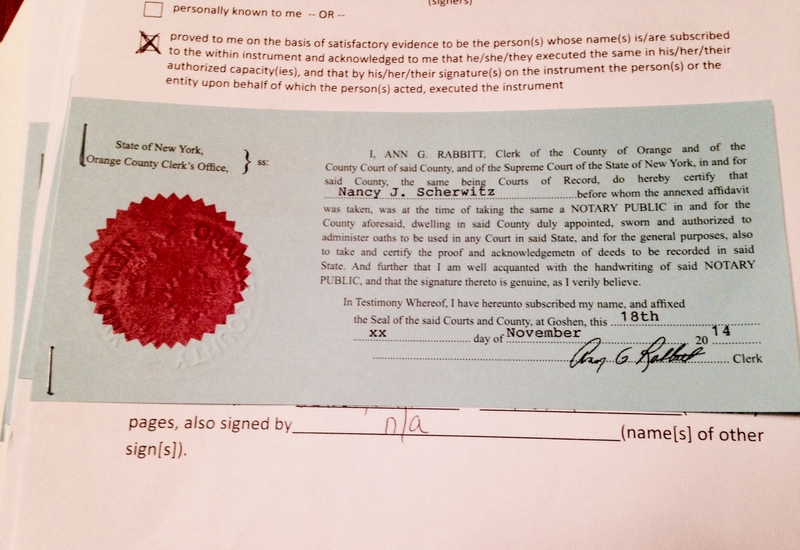 It usually takes the form of a sealed or stamped certificate that confirms the authority of a public official (such as a Judge, or a notary public) or of a signatory. Dossier: collection of papers containing very detailed information about you. The vast majority of countries open to international adoption require prospective adoptive parents to compile a dossier. Compiling a dossier involves gathering documents, having these documents notarized, and then adding various seals from your county, your state, and the U.S. government. Some of the documents required for your dossier are the same documents required by the USCIS and your home study. 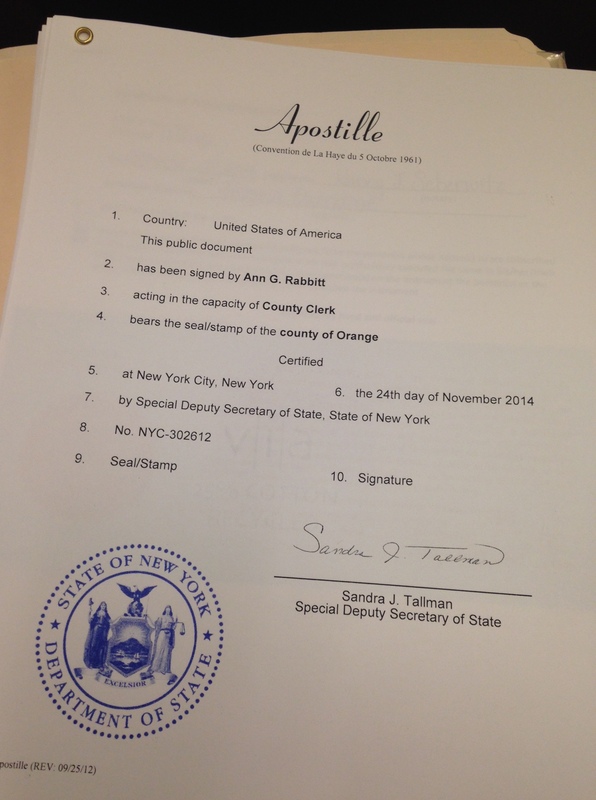 The vast majority of these documents have to be notarized, certified, apostilled, and authenticated. DGA: Director of general adoptions. The person, in Peru, you will have to request approval to adopt in a formal letter. DHS – Department of Homeland Security: DHS is the acronym for the U.S. Department of Homeland Security, the U.S. agency responsible for facilitating immigration cases, including those related to intercountry adoption. 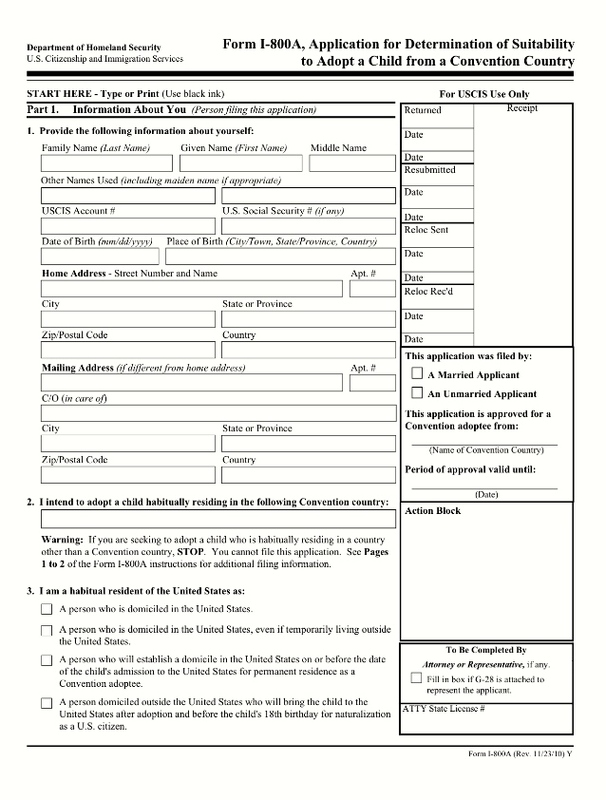 Form I-800a“Application for Determination of Suitability to Adopt a Child from a Convention Country”: USCIS Form for adjudicating the eligibility and suitability of the applicant(s) to adopt a child who habitually resides in a Hague Adoption Convention country. Hague Adoption Certificate: When a child emigrates from the United States (outgoing adoption case) to another Convention country, the U.S. Secretary of State issues a Hague Custody Declaration and a Hague Adoption Certificate. The Hague Adoption Certificate officially states that the child has been adopted in the United States, in accordance with the Hague Adoption Convention and the Intercountry Adoption Act of 2000. IAA – Intercountry Adoption Act of 2000: IAA is the acronym for the Intercountry Adoption Act of 2000, the Public Law that provides for the implementation of the Hague Adoption Convention. Post-Adoption: Post-adoption is the period of time after an adoption in a Convention country and is followed by a re-adoption in the United States. Post-Adoption Reporting: After a child has been adopted, some countries of origin have post-adoption reporting requirements. Adoption service providers must comply with the state laws of the jurisdiction where you live regarding the number of post-adoption home visits that are required as well. The adoption service provider includes a requirement for such reports in the adoption services contract. Post-Placement: Post-placement is the period of time before an adoption, but after a grant of legal custody, or guardianship of the child to the prospective adoptive parents, or to a custodian for the purpose of escorting the child to the identified prospective adoptive parents. USCIS: Unites States Citizenship and Immigration Services. A component of Homeland Security that also deals with approvals to adopt and awarding citizenship status to internationally adopted children. Visa: A Visa is an official authorization permitting entry into and travel within a particular country or region. When an orphan enters the United States with an immigrant visa, he/she is considered to be a lawful permanent resident of the United States, not a U.S. citizen.